The Amazing World of MC Escher is a new exhibit at the Scottish National Gallery of Modern Art in Edinburgh. It will be there from June 27 to September 27. The exhibit prompted a nice piece on Escher in The Guardian. Author Steven Poole mentions, but does not much explore, the relationship between Escher’s work and the work of mathematicians. But just a little bit of research on the topic suggests that there may be quite a lot to say about this. 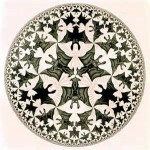 An article on Escher, in a 2010 issue of Notices of the American Mathematical Society, by mathematician Doris Schattschneider, gives a fairly thorough account of the extent to which some of Escher’s work qualifies as mathematical research. Many prints provide visual metaphors for abstract mathematical concepts; in particular, Escher was obsessed with the depiction of infinity. His work has sparked investigations by scientists and mathematicians. But most surprising of all, for several years Escher carried out his own mathematical research, some of which anticipated later discoveries by mathematicians. Escher was a young boy in the early 20th century. He grew up in Holland. His father was a civil engineer and his four older brothers eventually became scientists. Yet, Schattschneider reports, Escher said of himself that he was an “extremely poor” student of arithmetic and algebra, having “great difficulty with the abstractions of figures and letters.” His skill with geometry was a little better, but not one in which he excelled. He did, however, excel as a draftsman. And it was drawing that became both his method of inquiry as well as his expression of discovery. The questions he asked seemed to be about the essential qualities or properties of images – how a flat surface is made three dimensional, mistakes of perspective, impossible perspectives, filling the plane or tiling. Some aspect of his exploration involved perception itself, but his inquiry is also seen as one into the geometries of space. It was this visual exploration that brought him to the heart of some mathematical questions. And this is what I find most interesting, that it would all be done in the seeing and the drawing. The mathematics that Escher explored was known to him only in action, and expressed only in images. Escher chose a career in graphic art over architecture and was successful. He illustrated books, designed tapestry, and painted murals, while being, primarily, a printmaker. His subjects were often landscapes, buildings, or room interiors, within which he might explore the spatial effects of different, sometimes conflicting, vantage points. And there are early examples of his interest in the effect of filling the plane with interlocking, representative shapes. Escher became engaged in a series of thoughtful questions about shapes, tiling, and filling the plane, that he methodically explored entirely within the visual images he produced. He produced illusions, impossible figures, and a variety of regular divisions of the Euclidean plane into potentially infinite groupings of creatures like fish, reptiles, or birds. In his experience, fundamental human attributes (the perception of depth and space), the perspective achieved in drawing, and non-visual ideas like infinity, become very naturally bridged. The exhibition led to a correspondence between Escher and geometer H.S.M. Coxeter. Escher became preoccupied with Coxeter’s illustration of a hyperbolic plane, and while remaining blinded to the mathematical content of this illustration, (which Coxeter provided) he nonetheless succeeded in finding his own direct understanding. Mathematician Thomas Wieting presents a nice account of this exchange in a 2010 issue of Reed Magazine. And Wieting includes part of a letter Escher wrote to his son that expresses both his determination and his loneliness. My great enthusiasm for this sort of picture and my tenacity in pursuing the study will perhaps lead to a satisfactory solution in the end. Although Coxeter could help me by saying just one word, I prefer to find it myself for the time being, also because I am so often at cross purposes with those theoretical mathematicians, on a variety of points. In addition, it seems to be very difficult for Coxeter to write intelligibly for a layman. Finally, no matter how difficult it is, I feel all the more satisfaction from solving a problem like this in my own bumbling fashion. But the sad and frustrating fact remains that these days I’m starting to speak a language which is understood by very few people. It makes me feel increasingly lonely. After all, I no longer belong anywhere. The mathematicians may be friendly and interested and give me a fatherly pat on the back, but in the end I am only a bungler to them. “Artistic” people mainly become irritated. Escher’s enthusiasm and tenacity did indeed prove sufficient. Somehow, dur­ing the following months, he taught himself, in terms of the straightedge and the compass, to construct not only Coxeter’s figure but at least one variation of it as well. In March 1959, he completed the second of the woodcuts in his Circle Limit Series. It’s worth noting that, in his own articles, Coxeter provided mathematical analyses of Escher’s work and pointed out that Escher had anticipated some of his own discoveries. Seeking a new visual logic by which to “capture infinity,” Escher stepped, without foreknowledge, from the Euclidean plane to the hyperbolic plane. Of the former, he was the master; in the latter, a novice. Nevertheless, his acquired insights yielded two among his most interesting works: CLIII, The Miraculous Draught of Fishes, and CLIV, Angels and Devils. Wieting also gives us this, Escher’s own description of the success of CLIII. I placed emphasis on his reference to this “round world,” and “the emptiness around it,” because it reveals something of the depth of the meaningfulness born of this math-art-philosophy piece. In the colored woodcut Circle Limit III the shortcomings of Circle Limit I are largely eliminated. We now have none but “through traffic” series, and all the fish belonging to one series have the same color and swim after each other head to tail along a circular route from edge to edge. The nearer they get to the center the larger they become. Four colors are needed so that each row can be in complete contrast to its surroundings. As all these strings of fish shoot up like rockets from the infinite distance at right angles from the boundary and fall back again whence they came, not one single component reaches the edge. For beyond that there is “absolute nothingness.” And yet this round world cannot exist without the emptiness around it, not simply because “within” presupposes “without,” but also because it is out there in the “nothingness” that the center points of the arcs that go to build up the framework are fixed with such geometric exactitude. A beautiful gallery of prints can be found here.